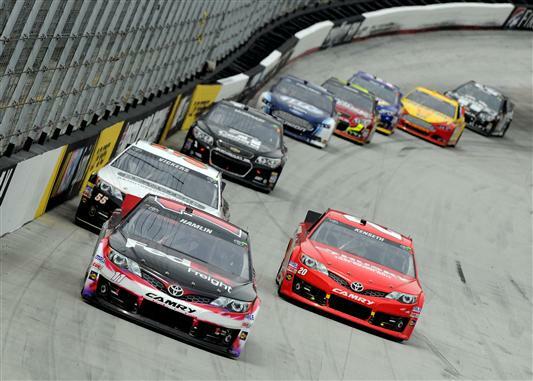 A trio of Toyotas leads a Chevy and a Ford in the Food City 500 at Bristol Motor Speedway. NASCAR offers much to be enjoyed throughout the weeks and months of its season. This year with the introduction of the Gen-6 car hearkening back to a time when cars looked the way they do on the road – manufacturer identification – the appearance of the cars has roped a lot of fans back to NASCAR racing. Ask NASCAR fans their favorite drivers and they usually have an answer. Dale Earnhardt Jr., Kyle Busch, Carl Edwards are popular drivers whose fans are loud and proud. But if one delves deeper, the answer is at times more involved as to why a fan chooses his or her driver. From the dawn of NASCAR, the make of the car was as important if not more important than who was in the cockpit of the racecar. There were Ford men. There were Chevy men. There were Dodge men. Their loyalty to the manufacturer was deep and entrenched. A definitive line has always been drawn between the fans of Ford, General Motors, Dodge, and in recent years Toyota. Ford has always been the manufacturer for long-time NASCAR mainstay Wood Brothers Racing. They are as tied together as peanut butter and jelly. That brand loyalty is what the founding brothers, Glen and Leonard Wood, are most proud of in their long careers. Other teams and drivers are not as consistent due to economics, the climate of the sport, or a combination of those factors. A prime example would be Joe Gibbs Racing. Gibbs entered NASCAR with General Motors as his manufacturer and had a strong run that earned him three Cup championships with drivers Bobby Labonte and Tony Stewart, two in Pontiacs and one in a Chevrolet. But many races won, a strong relationship, and good will was not enough to keep Gibbs at GM. Toyota wanted to make a foray into NASCAR and approached Gibbs with a package that apparently he could not refuse. The switch occurred and NASCAR fans around the country were unsure of this foreign marque coming into this uniquely American sport. The JGR organization underwent major changes in the years after the switch of manufacturers. They eventually lost star driver Tony Stewart who wanted to try his hand at team ownership. He did so, of course, returning to Chevrolet. On the other hand, Dale Earnhardt Jr. made an infamous break with his father’s company, Dale Earnhardt Incorporated (DEI), to drive for Hendrick Motorsports (HMS). A bold move, but overall a lateral move when it came to manufacturer since DEI and HMS both ran Chevrolets. Earnhardt Jr.’s father, Dale Earnhardt, drove Chevrolets at Richard Childress Racing. Those relationships are a strong tether that ties Chevrolet to the Earnhardts. In recent NASCAR history, Matt Kenseth left his long-time ride with Roush-Fenway Racing – a Ford-powered race team – for what Jack Roush called "the dark side," JGR and Toyota. Kenseth had only driven Fords for RFR and had even earned the team a championship in 2002. Fans had a difficult time knowing where to throw their allegiance. The Kenseth fans had to choose whether to stick with their driver as he not only departed the RFR team but the manufacturer, or to wish him well and learn to root for the driver who took Kenseth’s place on the team but who drives a Ford. With no championship to date, Toyota is still a hard sell for many NASCAR fans. People are indeed coming around, but the manufacturer “wars” that have always existed between Ford, Chevrolet and Dodge have intensified with Toyota because it's a foreign-owned company. But it seems to me that as Toyota continues to make inroads in the sport, their support continues to grow exponentially. Just this past weekend in Bristol, Kyle Busch, a JGR racer with 107 wins among all three of NASCAR’s top three series, won the NNS race. He is one of the drivers who could very well bring Toyota its first championship in NASCAR’s Sprint Cup Series. Busch’s teammates Denny Hamlin and the aforementioned Kenseth are all possible future champions to capture that honor for Toyota. Last year Michael Waltrip Racing was on a tear in NSCS, placing two drivers in the Chase. Martin Truex Jr. and Clint Bowyer had a remarkable showing, placing 11th and second in the points respectively. It seems 2013 is the season that both JGR and MWR feel is the time to earn that first championship for Toyota. Of course the HMS teams, including the No. 5 of Kasey Kahne who won at Bristol on Sunday, will do their best to deny Toyota their top honors. Whether you are a fan of the manufacturer or not, having Toyota in the mix has proven to up the competition and add drama to the NASCAR scene. The first three races of the season saw a Chevy, a Ford, and a Toyota visit victory lane. The top 10 in driver's points after Bristol includes four Chevys, three Fords, and three Toyotas. Whether that kind of parity will continue is yet to be seen, but at this point, no one make is dominant. From my perspective, the manufacturer’s competition is yet another reason why I love NASCAR. Chief 187™ is a writer, columnist, and blogger as well as creator of the widely popular Chief 187™Chatter. Her column “Why I Love NASCAR” and other articles are featured on Skirts and Scuffs. She can be reached via Twitter by following @Chief187s. To find out more please visit http://Chief187.com. Fantastic article Candice and spot on, the make of the car is as important as the driver. I personally am a HMS girl but do tend to go with any of the cars that have a Hendrick engine if my drivers aren't on top. I think this is a awesome year for all of us, the Gen6 will prove itself to all, it already has in many ways. It can only get better as the year goes by. I hope more and more fans will come to the races, this can only make our sport better, this is what the drivers, teams and owners want is a full house.